On 10 and 11 October 2018, the AQUACROSS Final Conference on "Ecosystem-Based Management for the Protection of Aquatic Biodiversity – Practice and Lessons Learnt" took place in Brussels. AQUACROSS project team members presented different tools and results on aquatic biodiversity protection developed in the project. Conference participants from 21 countries discussed the eight AQUACROSS Case Studies with great interest with project team members in the Case Study Gallery, an interactive networking space with posters and information material. The presentations held during the conference are now available on the AQUACROSS project conference website. 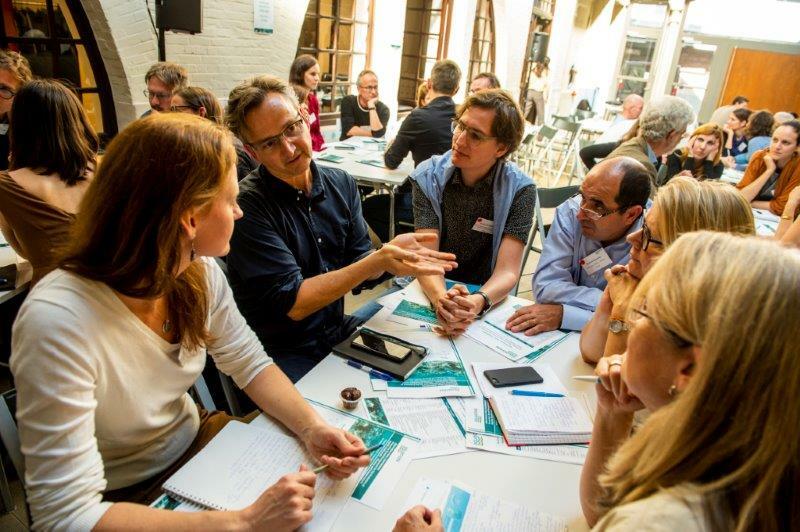 Ninety participants got together for this interactive multi-stakeholder event to engage with experts from science, policy, and business, to share experiences, learn from case studies and help shape future research for the management of aquatic biodiversity. The AQUACROSS project team presented their work and advancements made since the project's start in 2015. The presentation of project results was complemented by external speakers from the field of aquatic biodiversity management and protection. Their contributions to the six conference sessions on aquatic biodiversity management in the EU and beyond led to compelling panel discussions with the AQUACROSS partners as well as engaging dialogues with the conference participants. A highly interactive event format distinguished the Final Conference, as the aim was to go beyond presenting the results of the project by actively engaging participants from science, civil society and policy making in transdisciplinary discussions. These fruitful small-group discussions supported the development of key messages to be integrated into the final outputs of AQUACROSS, to be expected at the end of November 2018. AQUACROSS project team members presented different tools and aspects regarding aquatic biodiversity developed during the project, such as tools to assess the socio-ecological system and ecosystem services, the analysis of environmental and sectoral policy at the regional and local level, the development of scenarios, and the AQUACROSS Information Platform. Furthermore, conference participants received the eight AQUACROSS Case Studies with particular interest. These case studies are located in the freshwater (Danube river, Lough Erne Northern Ireland, Ria de Aveiro Portugal, Swiss Plateau), coastal and marine realms (the North Sea, Andalusia, and Morocco, Azores). For each of the case studies, an individual ecosystem-based management plan was developed. A Case Study Gallery with posters, photos, and information material allowed participants to get more in-depth information on all eight case studies during conference breaks and enjoy a direct exchange with the coordinators of these studies. A highlight of the conference was its final session, which examined opportunities for the protection of aquatic biodiversity beyond 2020. An interactive panel allowed for a discussion between representatives from the Biodiversity Unit of the DG Environment of the European Commission (Stefan Leiner), IUCN (Luc Bass), the World Ocean Council (Christine Valentin) and the Programme on Ecosystems, Economies and Sustainable Development of GRID-Arendal (Christina Neumann). The panelists reviewed the proceedings of the conference, took up discussion points from the audience and provided their insight from the current EU biodiversity agenda. The panel emphasized the importance of setting specific targets for biodiversity protection. Furthermore, it underlined that many pressures on the aquatic environment originate from land-based activities, hence these should be addressed primarily. Moreover, the panel highlighted the potential of engaging business stakeholders to achieve EU Biodiversity Strategy 2020 targets in reference to sustainably protecting aquatic biodiversity.